At this week’s Napa Chef’s Market Chef Gerry of Tarla Mediterranean Restaurant will be demonstrating his recipes for baklava and hummus at 6:30. Following him will be Terry Letson of Fume showing you how to make a Nutella Swirl Poundcake for dessert. Whether using as a dip, spread or even a filling, hummus is great to have on hand. And whipping up a fresh batch is straightforward. 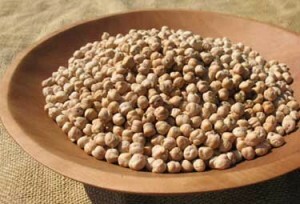 Of course, on e of the most important ingredients are quality chickpeas (or garbanzo beans), such as the fresh peas from Rancho Gordo. You’ll need two cups cooked chick peas for this recipe to produce about 3-4 cups of fresh hummus. Rancho Gordo recommends cooking the beans (unsoaked) in a slow cooker for about four hours. You can also simmer them in a heavy pot until done. You’ll know they’re ready when they are fragrant. Place all ingredients in a food processor and puree until creamy. Garnish with a drizzle of extra virgin olive oil and paprika.